Pygmy sperm whales are larger than the dwarf sperm whales (Kogia sima). At birth, they are about 1.2m long and weigh about 50kg. Adults can grow to 3.5m long and weigh up to 450kg. The lower jaw contains 12-16 pairs of long, sharp teeth. Life span is known to be, at least, 23 years. These animals have a very unusual robust body shape, that somewhat resembles a small sperm whale (Physeter macrocephalus). They have a shark-like head with a narrow lower jaw. 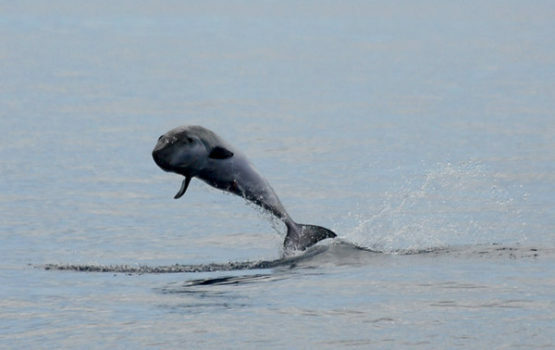 The small dorsal fin is usually set well behind the midpoint of the back, and is typically strongly falcate. 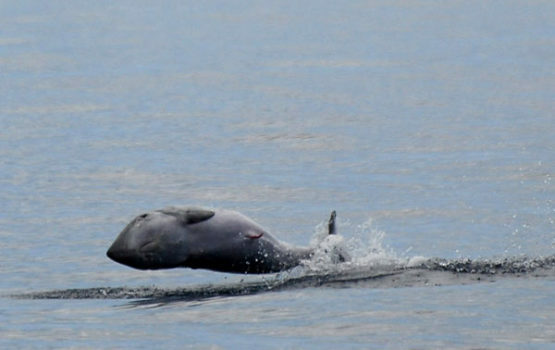 There is often the appearance of a hump on the back, between the blowhole and the dorsal fin. 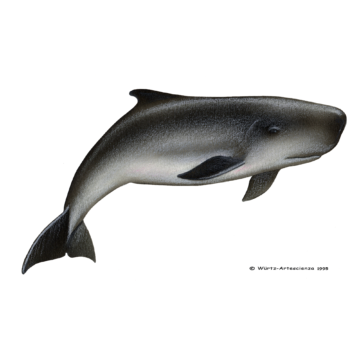 Pygmy sperm whales are countershaded, ranging from dark brownish-grey or black on the back to white, often pinkish bellow. Usually a darker patch encircles the eye. There is a light coloured marked, C-shaped, usually referred to as a “false gill”, along the side of the head between the eye and the pectoral flipper. Studies of feeding habits, based on stomach contents of stranded animals, suggest that this species feeds in deep waters, primarily on cephalopods. 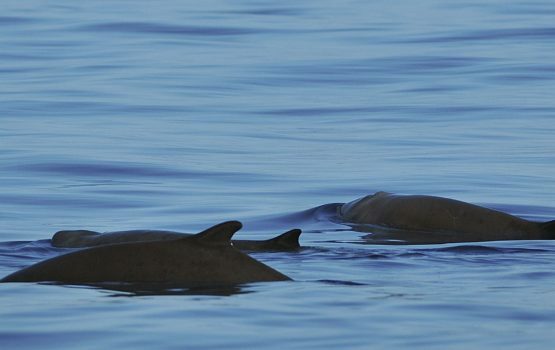 Most sightings of pygmy sperm whales are of solitary animals or in small groups, usually less than five individuals. Births seem to occur in spring and summer. When sexually maturity is reached at the age of 3-5 years old, females may reproduce annually. 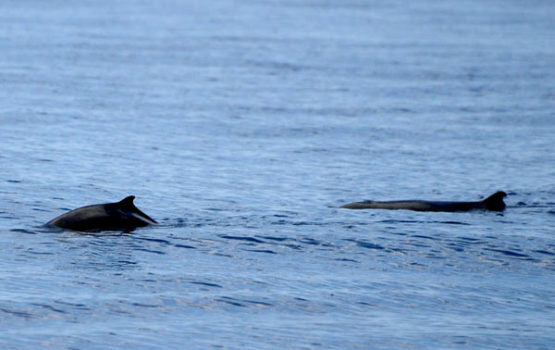 They are not commonly seen alive because they are very difficult to detect, except in calm seas; but they are among the most frequently stranded small cetaceans. When at sea, they appear slow and often raft motionless at the surface with no visible blow. They may simply sink out of sight, or roll to dive, especially when startled, which is when they emit a dark reddish-brown fluid mimicking squid ink, to escape without detection from whatever frightened them. Pygmy sperm whales are known from deep waters in tropical to warm temperate zones of all oceans. They seem to prefer somewhat more temperate waters than dwarf sperm whales which are usually found in more tropical waters. Pygmy and dwarf sperm whales can be rather difficult to distinguish at sea. The first grow to slightly greater total lengths, and have smaller, more rounded dorsal fins, set farther back on their backs. Due to the difficulty of detecting this species, it’s not frequent to spot pygmy sperm whales in the Azores. However, typically every season we have one or two sightings of this elusive species. The majority of the sightings occur in July and August, but we’ve had sightings from May until October. All the sightings occurred in flat, calm sea days.